In 2008 the Rotary Club of Grovedale placed a commemorative rock and plaque in the cemetery adjoining St. David’s Lutheran Church, Freshwater Creek, in memory of early German pioneer settlers. The first Lutherans settled at Freshwater Creek (near Geelong, Vic.) in 1858 and 1859. Initially services were held in members’ homes until their first church, a wattle and daub structure, was built in 1859. They named it “Waldkirch”, meaning “Church in the woods”. 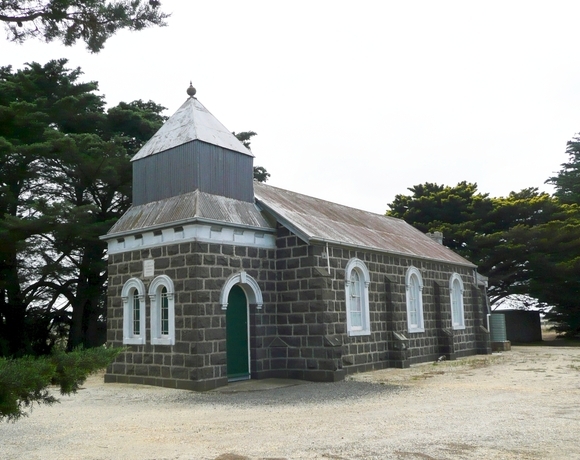 This year marks the 150th Anniversary of the first church at Freshwater Creek, as well as the 140th Anniversary of the present church building. The present church building has a special classification on the Heritage Register as a place of state significance. A commemorative service was held at 2.30 pm on Sunday 18 October 2009.